Having skin on the slightly oiler side of things means I try to stay away from shimmer as much as possible, especially around my t-zone. Using shimmery bases, or anything too illuminating usually ends badly. However, sometimes my skin just needs a little bit more of a glow, and these are the products I reach for. It's not that I avoid illuminating bases completely, some of my favourite base products are marketed as 'brightening' and 'radiant'. On days where I do happen to reach for a more matte base, I will nearly always finish with a light dusting of MAC's MSF in Lightscapade. This gorgeous powder is ever so fine, and really gives that 'glow from within' look. Next up - a very similar product, but a tad cheaper, with the added bonus of gorgeous packaging and a beautiful delicate scent. Bourjois' Java Rice Powder took the blogging world by storm when it was re-released for their 150 year anniversary last year. The vintage-inspired mint green packaging was a huge hit, and the product inside doesn't disappoint either! A very finely milled pinky-toned loose powder, perfect for sweeping across the tops of your cheeks, or using all over for even more illuminating power. Benefit's High Beam is probably my least favourite of the three, as I do prefer my highlighters/illuminators to be in powder form, as I think it helps to make the glow look more natural, and easier to build up in the right places. Having said that, this one definitely shows up more than the other too, and packs more of a glowing punch, as it's thicker. Great if you only want the glow in certain small places, rather than all over. And last of all, Sleek's Rose Gold blush. On my normal, natural complexion, this doesn't look exactly 'right.' However, when I've added a little more colour to my skin, or been on holiday, this is perfect! A beautiful pink blush with tiny flecks of gold scattered throughout. This is the ultimate blush for tanned skin, and gives a pop of colour and a natural looking glow all in one sweep. definitely agree that highlighters work better in powder form, so much more easy to apply! Lightscapade looks beautiful, must go and try it! Lovely picks. I too have been loving adding a bit of a glow, as my skin has been looking so dull recently. I think I really need to get more powdered highlighters now! I too prefer things in powder form, and I always forget to apply my liquid highlighters. Have you tried theBalm's Mary-Loumanizer? It seems to be a cult fave! So true, powder ones are much quicker as well, I sometimes find liquidy ones really hard to blend in properly! Ooh...I've actually never tried adding any sort of shimmer to my makeup regime, but I'd love to try out the Bourjois product! 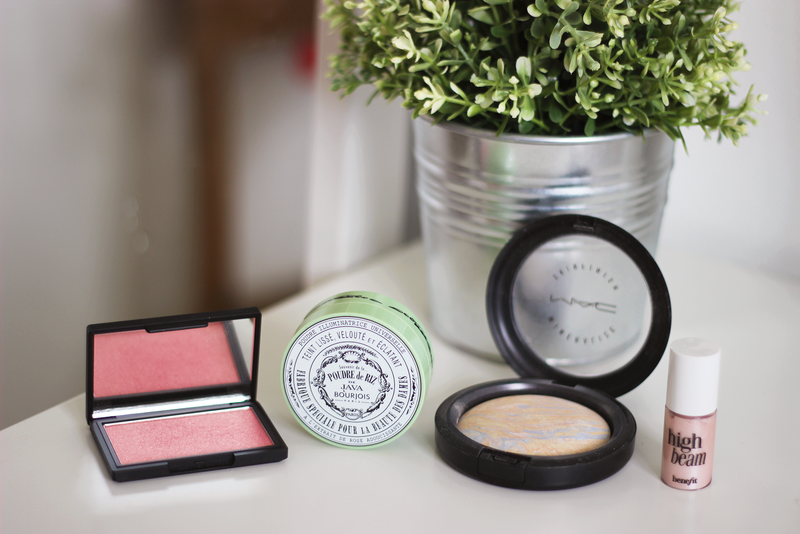 I adore the Sleek Rose Gold blusher. It's one of my all time favourite blush! I love Highbeam! I use it pretty much everyday but I don't really like the brush because it kind of feels like you're painting your face :L Lovely post Hales! I've been dying to try the Bourjois powder for so long now, such a loved item!